Media One brings to you, a top-class large format printer from d.gen that gives you 1500 sqft/hour print production. Launched at the ISS Long Beach 2018, Papyrus Arete uses the best-in-class latest print heads Xaar®1201 that contain 1280 nozzles, 600 native resolution by 2.5 pico liters drop size. This ensures high definition prints even at high speed. So what is it about the Papyrus Arete that gives it an edge over its competitors? The Papyrus Arete is equipped with a well designed capping and wiping system that prevents the print heads from drying and has the ability to keep them clean at all times. Thus, making maintenance easy. The differential tension in between the feeder and take-up units is adjusted at all times for a perfect winding with no cockling or wrinkles. 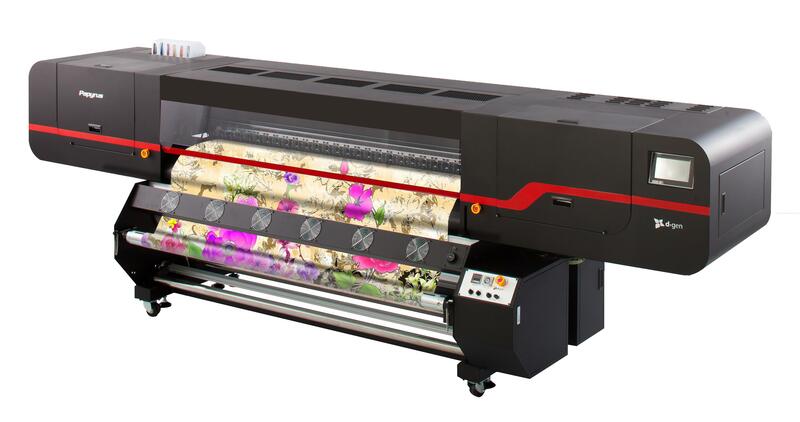 The Papyrus Arete can hold mini jumbo rolls of 100 kg or even more with auto flexible tension control system which allows non-stop large volume printing. It is also possible to attach 2 or 3 kg ink cartridges to ensure uninterrupted printing. All these features, make the Papyrus Arete perfect for even the biggest of print houses. Defect free production, non-stop large volume printing, higher performance and longevity of print heads, easy to use and maintain are some of its highlights.